Deer slaying rifles don’t get much more classic than the Marlin 336. This gun is a hunting workhorse, chambered for either 30-30 Win. or 35 Rem. If you have one of these lever action beauties or are looking at getting one, you may be wondering what the best scope for Marlin 336 could be. Some things you will need to look for in a scope to outfit this gun is the weight factor, magnification range, lenses, coatings and durability, and the reticle choice. Let’s take a look at some good scopes and see if we can find one to fit your Marlin rifle. When looking for the perfect scope to fit your Marlin 336, you must consider the overall weight. The Marlin 336 is not a heavy rifle. At 7 lbs, they designed this rifle to not be too burdensome when you need to trek through the woods and mountains all day. The same should be true for the scope. You want to choose a scope that is not too heavy for a couple reasons. First, you want to keep your total pack weight as light as can be. You may be dragging out a deer after-all. Second, you don’t want to weigh down your rifle and throw off your aim. For this weigh factor alone, you really don’t need to go overboard on optic magnification, which will significantly affect the scope weight and balance on the rifle. When considering your magnification power, you will need to know at what distance your max firing range will be. Honestly, for a Marlin 336, most believe the ideal power range is a 2x or 3x, or even a 4x, but you probably don’t want to go much higher than that. You want your power range this low because the optimal magnification power is the lowest setting you can put it at where you have a clear view of your entire target. For hunting with a 30-30 lever action rifle, you probably won’t be shooting at a distance of much more than 300 to 400 yards, so this power range is more than sufficient. The other reason is that the crazier you get with your magnification, the more layers and treatments and glass is added to the optic, thus increasing the weight. Some of these high-powered scopes can get very heavy, and that would not be beneficial for your shooting, or your back. Your lenses could be the most important part of your scope. Proper glass enables you to see so without it, you have no scope. You don’t want too many glass layers due to the weight factor, but you need enough to be as durable as possible. When picking out your scope, you want the clearest glass you can find. Nice clear glass, a wider optic, and the protective coatings will make for a cleaner, better view of your target. The wider the optic, the better the light transmission, field of view and eye relief will be. With more accrued light, you get less shadow and mirage effect. The coatings do a lot to improve your lenses. Ideally, you would get a scope with fully multi-coated lenses, which means that every optical lens is multi-coated with different protective coatings that perform different functions. Some of the coatings will help brighten your view and are slightly colored to block some of the reflecting light and shadowing. Some of the coatings are for water resistance and will shed water in either sheets or beads so as to cut back on image distortion. Other coatings are for scratch resistance and make your lenses tougher. Best case, you want all of these types of coatings to protect your optic. Other than the coatings, you want a nice durable scope that will be waterproof, fog proof and shockproof. Generally, a heavy duty aviation grade aluminum is used for the body of the scope for shock-resistance. For waterproofing and fog proofing, the body tube is then gasket sealed around each lens and gas purged to replace any oxygen and keep moisture out. Reticle choice is all personal preference. There are so many reticle choices out there, it may be hard to choose. Many people like the BDC reticle, which is more for long-range shooting, but the best performance is only out to about 300 yards. MIL dots and MOA marks are a good choice as they are so versatile they’re almost universal. An illuminated reticle may be fun to have, but you will add a little extra weight due to needing a battery. Personally, for this gun, I would stick with the old school simplicity of a regular thin cross-hair or a 4-plex reticle. A 4-plex is basically a simple cross-hair, but the outer half of each line is thicker, while the inner halves that cross are thin lines. This way, you get the benefits of both the thick and thin lines. The thicker lines won’t obscure your target, but the thinner lines won’t get completely lost due to magnification as you will have the thick outer lines as a reference point. It’s a win-win in my opinion. Now that we know what features to look for to properly compliment your Marlin 336, let’s check out our top 5 picks and see if these are in line with what you are wanting to pair to your hunting rifle. The Nikon Buckmasters II is a great multi-coated lens scope that claims bright, high-resolution images and precision targeting out to 600 yards, thanks to the BDC reticle. Its tough waterproof, fog proof and shockproof body is O-ring sealed and nitrogen purged for excellent moisture protection. Nikon is well known for their quality optics, and this scope is no exception. The magnification on the Nikon Buckmaster is 4-12x powered and offers good eye relief and field of view. At 1.3 lbs, this scope would be a great runner-up for your optics decision. Customers who use this scope have such high praises for Nikon. They claim it is high quality with clear optics, holds center, is easy to use and zero, lightweight, and great for a budget! Overall, most customers had no complaints about the product. Of the complaints, it seems that the turrets and adjustments are prone to defect or failure. Also, some have complained that it is more difficult to use the warranty than with other brands. The Leupold Rifleman is a rugged, absolutely waterproof scope with the huge advantage of being backed by Leupold’s full lifetime warranty. It is accurate, reliable and repeatable with a wide duplex (same as a 4-plex) reticle, and is resistant is scratches and abrasions. The lenses of this scope are a little bit special. They are fully coated for a clear, bright image in any light condition. However, one of this scope’s features is a 3x Leupold lens erector system which means it contains lenses that move and adjust according to the windage and elevation adjustments. It also sports a wide field of view for quick target acquisition and is lightweight at only 1.2 lbs. Customers who use this scope love the good quality and how well it holds zero. They also like the very clear optics, easy set-up and “good bang for your buck.” Some people are big fans of the friction turrets, and some really don’t like them. That’s about the only real complaint, and it seems to be a personal preference thing. The Simmons Truplex Riflescope is an amazing little wallet-friendly 8-point scope that offers outstanding precision. It is very tough, with a waterproof, fog proof and shockproof design, and a Truezero fingertip windage and elevation adjustment that prevents movement from out of zero. The high-quality optics are fully coated and clear and bright, featuring a Truplex reticle that, again, is similar to the 4-plex. Another great feature is the quick target acquisition eyepiece (QTA) for quickly acquiring your target. On top of everything else, this scope is super light, weighing only 10.1 ounces. Customers of this product absolutely rave about the quality for the price. It can’t be beat! They love the clarity of the lenses and brightness, and the way it holds zero amazes people. Also, it seems it is quick and easy to sight-in. The negatives about this scope seem to be that the reticle could be off. Several people have reported this being a problem, or that the inner components are compromised somehow. It seems that the Vortex Optics Crossfire II has a scope for every weapon out there! This scope comes with a choice of reticles, a dead-hold BDC MOA reticle, a V-Bright illuminated MOA, or a V-Plex MOA reticle. It has a long eye relief, ultra-forgiving eye box, and a fast-focus eyepiece that allows for quick and easy reticle focusing. The bright, clear lenses are fully multi-coated and anti-reflective, and the capped reset turrets are finger adjustable and reset easily to zero after sighting-in. 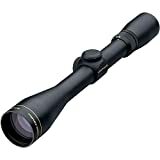 This scope is durable, constructed of single piece aircraft grade aluminum for recoil and shock-proofing. It is then O-ring sealed and nitrogen purged for waterproof and fog proof operation. For all this reliability and cool features, the Vortex Crossfire II weighs a whopping 1 lb. People love the quality and reliability of Vortex scopes. Customers consistently report nice clear glass and great eye relief. People also express that it’s a very good value for the money. It seems that some problems customers have reported with this scope are the reticle either floating or spinning. Also, some have had issues with it holding zero. Finally, the Leupold FX-II Ultralight is, as the name suggests, ultra-lightweight at only 6.5 ounces. It comes with Leupold’s classic/standard lockable, fast-focus eyepiece which makes fast reticle focusing easy and easy to maintain. It is also one hundred percent waterproof and fog proof. The Leupold FX-II has a low magnification range and a wide duplex reticle, so this would be sort of a nice closer range scope. It is much more rugged than it looks and has been treated with DiamondCoat lens coating for ultimate scratch and abrasion resistance. This scope also features a Leupold exclusive, the Indexed Matched Lens System which provides exceptional brightness and extremely sharp resolution across the entire visual field. Customers love the fact that not only is it Leupold, but it is incredibly light, compact, clear and rugged. Not only does Leupold offer a great lifetime warranty on their scopes, but the quality is amazing and so easy to install. No wonder they are a leading name in reliability! As far as negative comments for this scope, there were none noted. People like it that much. What is the different between a fast-focus eyepiece and a QTA? – The fast-focus eyepiece is a system for adjusting and focusing the reticle to the distance of your target. Sometimes, if the target is too far away or too close your reticle may look blurry. This just focuses it and sharpens the image. The QTA (Quick Target Acquisition) eyepiece is the same as the fast-focus eyepiece, it is just the Simmons brand. What is repeatable? – Repeatability is the consistency that the reticle is moved when the windage and elevation adjustments are made. In other words, if you sight-in your reticle at 50 yards and your tick mark is 1, then you sight-in at 100 yards and your tick mark is at 8, if the reticle is repeatable then when you move back to 50 yards it should hit at the same place. If it is off and you have to adjust to say 2, then your scope is not repeatable because the reticle does not move consistently. Usually, repeatability is a little bit higher quality. What is an 8-point scope? – This is just this particular model scope by Simmons. They come in many different sizes, and they all feature the Simmons Truplex reticle. Would a BDC reticle be good for a Marlin 336? – This is all personal preference. Many people really like the BDC reticle and some of our top five picks feature a BDC (Bullet Drop Compensator) reticle. It is usually more appropriate for longer distance targeting. That said, the optimal functioning range of the BDC is only out to about 300 yards. Personally, I think if you were to outfit your Marlin 336 with a BDC reticle, it would work out just fine. What is the difference between a fully-coated lens and a fully multi-coated lens? – The lens coatings have different meanings depending on how they are worded. A fully-coated lens has a protective coating on each lens, whereas fully multi-coated lenses have multiple protective layers of coatings on each lens. The fully means each lens, the multi means multiple coatings. Lenses can also be just coated or multi-coated, meaning that maybe only a single lens is actually treated. I hope this guide has helped you to decipher what kind of qualities you are looking for to find the best scope for Marlin 336. For me, the big factor for this rifle would definitely be the weight factor. Especially with that nice lever-action. With too heavy of a scope, your gun will be bouncing all over the place when you work the lever. Anyway, our top five picks should be a good starting point for you, and maybe you even picked one out that would be a perfect match for your rifle. Decide what you like, go with your gut, and you will be on your way to an excellent hunting season! Want to read more? If you own a Glock 43 you may be interested in reading our article about some great night sights to pair with it. Also, here’s a similar article for the Marlin Model 60.